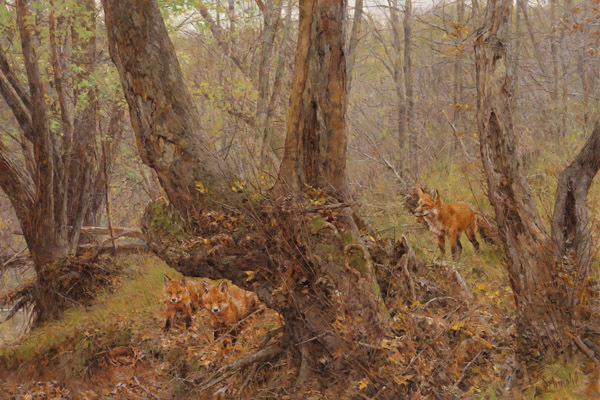 Schmehl’s detailed paintings reflect the many historical aspects he includes in his images. As an avid reader, the artist tries to capture in his mind the events chronicled in the books and other materials he reads. Schmehl also consults with historical experts. Armed with all the research available to him, the artist’s goal is always to paint each element of an event or story. From uniforms to weapons to horses to even the time of day and weather conditions, Schmehl’s paintings are as authentic as possible. Schmehl has traveled throughout the country in pursuit of his subject matter. Extensive trips to Civil War battlefields, to other historical sites, to even being on the range in Texas have allowed the artist to collect and record the many, many notes, sketches, and library of materials that contribute to Schmehl’s fine work. A Schmehl painting gives the viewer a unique perspective on the subject matter portrayed. As the details in the image come to life, an appreciation of history is evident. When not on a research trip, Schmehl cherishes the time he and his wife, Becky, spend in their 1885 Victorian home with their two cats. As committed Christians, the artist and his wife are active in their church; Brad plays the guitar in the worship band. Come live history through the eyes and paintings of Bradley Schmehl…it will be a most enjoyable journey.